We all have that friend- I am that friend! Someone organised who knows what to do, writes you lists and gets grumpy at you when you haven't booked something you were supposed to. Wedding Planning can be pretty stressful, you need a bridesmaid who you can bounce ideas off and vent to and their response will always be very neutral. They don't have big opinions but tell you straight when you are over-thinking something or worrying about other peoples opinions too much. We all have a friend that is only too happy to help and takes direction well. You can get this friend to run errands for you and to help with menial tasks and they'll be only too happy about it. Having a bridesmaid that is creative and you can trust to design those invites or tie those bows will take a huge weight off your shoulders. When it all gets a bit much you need that bridesmaid that will make you laugh and take all the stress away and bring you back down to earth. This friend won't take the planning so seriously and will make a lot of jokes about the process. Wedding? What wedding? It's all about the bachorette party baby! 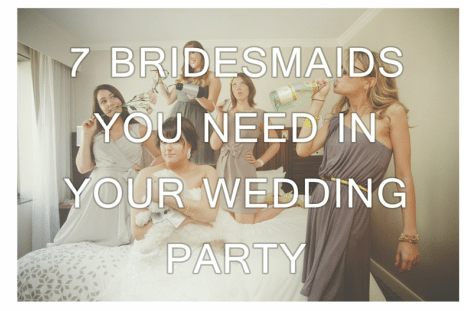 This bridesmaid will make sure that at every turn there will be a celebration. There's always that one person who is always snapping away pictures on their phone and uploading them to their various social media sites, with a Paparazzo in your group your journey will be well documented.